Elliott State Forest. Photo credit Tony Andersen/Oregon Department of Forestry, courtesy of Flickr. When Utah Rep. Jason Chaffetz (R) renewed his long-running effort to sell 3.3 million federal acres earlier this year, hunters and anglers launched an aggressive social media campaign to kill the bill, arguing that states in turn would auction off the lands. "Keep our public lands for the many not for the few," one Instagram user wrote to Chaffetz, who went on to withdraw the legislation within days of its introduction. "The people of Utah value our public lands; listen to us" (Greenwire, Feb. 2). In challenging Chaffetz and other proponents of transferring federal land to individual states, sportsmen and conservationists often turn to one particular argument to shore up their opposition: Turning over public lands will result in states selling those parcels off to the highest bidder. "Look at history: States have a track record of selling these lands that were given to them at statehood," said Land Tawney, executive director of Backcountry Hunters & Anglers, which led the protest against Chaffetz's bill earlier this year. "The concern here is they've already done it, and they could definitely do it again." But exactly how much federal land ends up in private hands once it has been transferred, sold or exchanged with individual states is an open question. While the Congressional Research Service reported in 2014 that the federal estate had shrunk by 23.5 million acres since 1990, or about 4 percent, there is no formal system for tracking former federal lands. That leaves conservationists to turn to property known as "state trust lands" as the best example of what could happen should advocates of disposing of the federal estate achieve their goals. Those state trust lands, given to states upon their admission to the union, remain largely concentrated in the western United States: about 40 million acres across Arizona, Colorado, Idaho, Montana, New Mexico, Oregon, Utah, Washington and Wyoming. "Groups fall back on that example because there haven't been large transfers of federal public lands to the states since those original agreements," said Matt Lee-Ashley, director of the Public Lands Project at the Center for American Progress. "Instead, you've had a few more narrowly tailored agreements but no examples of large-scale transfers." But even turning to state trust lands for research on what becomes of public land can prove difficult. The Wilderness Society released an analysis on state trust acreage in New Mexico last month, revealing that the state has sold nearly 30 percent of the land it originally received from the federal government more than 100 years ago (Greenwire, March 21). Because the state does not keep a specific database of prior sales, Wilderness Society New Mexico State Director Michael Casaus told E&E News the organization had to sift through reams of microfiche and other archival information in the state land office to piece together who purchased acreage and how it has subsequently been used. The Wilderness Society similarly reviewed data in 2016 on more than 16,000 parcels of land in Idaho to determine that the state had sold off 41 percent of its original federal acreage to cattle ranchers, timber companies and private homeowners (Greenwire, May 5, 2016). "It's basically a forewarning that if our public lands were under state control, they could be sold off anytime to private interests and corporations for profit," Casaus said last month. Shawn Regan, a research fellow at the Montana-based Property and Environment Research Center, argues that it's not appropriate to compare state trust lands to other would-be state property. "To the extent that we're talking about transferring lands to state control, it requires an understanding of how states manage public lands," Regan said. "Federal lands are usually multiple-use, while state lands are used to generate revenue. In practice, that results in very different land management practices." That's because state trust lands are not technically public lands but rather are intended to generate funds for public institutions, such as schools, universities and hospitals. Regan noted that unlike lands under control of the Bureau of Land Management — which may be home to a variety of uses, such as hunting or fishing and other recreation, as well as energy development — "state lands are a unique thing, and they're often misunderstood." The lands may be open to recreation or hunting, but typically the state generates funds by requiring contracts giving individuals or even other state agencies access to do so. Land may also be restricted for timber harvesting or oil and gas extraction. "That singular mandate [to generate funds] doesn't always mean that we end up mining or harvesting or grazing these lands; it opens up opportunities for unique contracting arrangements to gain access to these lands or recreate on these lands," Regan added. Regan likewise disputed suggestions that selling portions of state trust land results in a one-time profit for states, noting that such funds are deposited in state-controlled "permanent funds" that are dedicated to funding the same institutions. New Mexico is one state with a notably robust Land Grant Permanent Fund, which in fiscal 2016 provided more than $656 million to schools, universities and other public institutions. Still, Regan acknowledged that it remains to be seen how proponents of public land transfers would address management of a flood of new state land if they won their push for control of federal acreage. "If there was a large-scale land transfer, the question is how would those lands be managed?" he said. The American Lands Council, which advocates for the transfer of the federal estate, asserts that states will be able to create "compatible economic productivity" to provide for costs like roads, utilities and emergency services on public lands. "The argument that states cannot afford to manage their own public lands is a fallacy," ALC said in a statement provided to E&E News. The group does not offer specifics on land supervision, other than to note that former federal lands would be "managed in accordance with state and local plans." ALC has also highlighted a 2015 report from the free-market Property and Environment Research Center that shows state trust lands earned $14.51 per dollar spent on management, compared with the federal government's 73-cents-per-dollar return rate (Greenwire, March 6, 2015). The report did not address how much states would be required to spend on wildfire suppression if they took over control of federal lands, however, leaving out a significant cost factor. That focus on generating income from state trust lands, however, is exactly why conservationists should look to such acreage to predict what states might do with a sudden influx of land, said Center for Biological Diversity Public Lands Director Randi Spivak. "Their goal is revenue generation. They don't prioritize conservation, recreation, wildlife habitat," she said. "I don't think it's a direct comparison, but I do think it's instructive because states want these lands not because [of] their desires for conservation and wildlife habitat; they want these lands for extraction and to produce revenue." Spivak — who asserted that land transfers should be referred to as "seizures" or even "stealing" — noted that President Trump and his political advisers made similar arguments during the 2016 presidential campaign. In an interview with Field & Stream during the campaign, Trump argued against divesting federal lands, saying states might sell public lands when facing budget woes. Similarly, Donald Trump Jr., seen as a key liaison between the Oval Office and the Interior Department, told voters in Colorado last year that transferring lands could reduce public access for hunters and anglers like himself. "There should be no transfer back to the states where they can just unabashedly sell them to developers to make up for a budget shortfall," Trump Jr. said at that time (E&E News PM, Sept. 23, 2016). While agencies like BLM, the Forest Service, the Fish and Wildlife Service or the National Park Service may sell or exchange land from time to time, Spivak said such transactions can't predict what a state would do when faced with more significant overhead for managing millions of new acres of land. "Those low-level kind of transactions, adjusting boundaries, that's not the issue we're talking about here," she added. "I don't think it would take much imagination to paint a picture of what happens." Conservationists who see the state trust lands as a preview of potential fallout for large-scale land transfers point to Nevada as a reason for concern. While Nevada originally had 2.7 million acres of state trust lands, it now retains only about 3,000 acres. Other states, such as Montana and Wyoming, have as much as 90 percent of their initial estate. "One of the broader concerns is that the state governments don't have a lot of extra resources available for land management," said Lee-Ashley. Nonetheless, Nevada remains the state with the largest ratio of federal land, accounting for nearly 60 million acres, or 85 percent of the state's total landmass. That makeup prompted congressional approval of the Southern Nevada Public Land Management Act in 1998, which allowed the sale of federal land in the Las Vegas area. 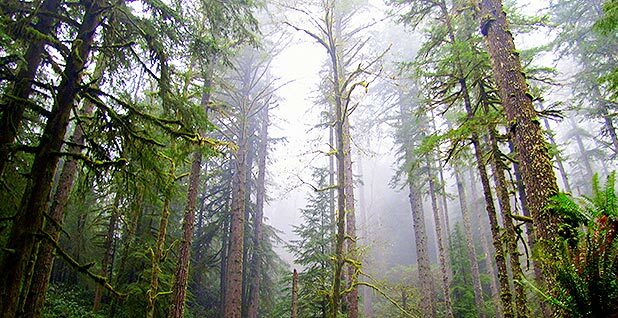 More recently, conservation and sportsmen's groups have raised concerns over the proposed sale of the 82,500-acre Elliott State Forest in Oregon, which sits on state trust lands. The Oregon State Land Board voted in February to sell the forest to Lone Rock Timber and the Cow Creek Band of Umpqua Tribe of Indians for $221 million. In the wake of public outcry over the sale, Oregon Gov. Kate Brown (D) — the only vote against the sale on the three-member land board — has pushed a plan to allow the state to seek public ownership of the forest. State Treasurer Tobias Read also indicated last month that despite voting for the sale in February, he would not support an alternative. The board is set to meet May 9, when it will review both a sale agreement and other options. "It's not making them enough money, and so they're going to sell it," Tawney said of debate over the forest. He argued that such decisions ignore the "intrinsic value" of the land. "The American people lose out every single time: It's a short-term gain for a long-term loss," Tawney said.